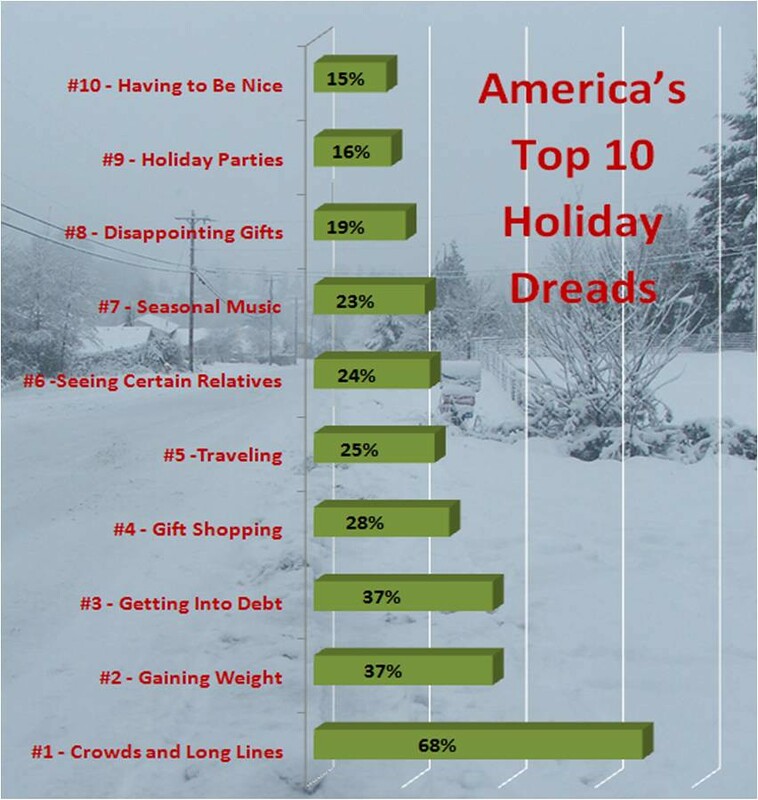 Not everything about the Holiday season makes us merry, but Consumer Reports got some unexpected answers when they asked Americans what it is they most dread about the holiday season. Apparently, “Having to Be Nice” made the top 10! First off - the holiday season is a psychology nerd’s dream – a strange mixture of intense and often contradictory feelings, a smorgasbord of psychological trickery and phenomenon at work. But if beneath the glitter, lights, and pine décor, you have some less than joyful feelings about the season, you wouldn’t be the only one. Making sure your family’s holiday is adequately jolly can, ironically, make us miserable. Just ask a psychologist’s office – it’s their busiest time of the year! Those resentful feelings have remained our guilty secrets - secrets a new study released by Consumer Reports this week, sought to shed some light on. So. What DO Americans most dread about this “wonderful” season? And keep in mind – 15% of America represents 35 MILLION people - 35 million people whose most dreaded part of the holidays is being forced to pretend they’re enjoying it . "For all the chatter about nostalgia, family fun and gift giving this time of year, many people don't like too much of a good thing… This commercial overindulgence wears on most of us…The long season appears to sour the Tiny Tim in all of us." said senior editor at Consumer Reports, Tod Marks. With this in mind, why not give yourself a break? It’s hard, but try not to worry too much about the way the holiday is “supposed to be”? Makes you think! Thanks Erin. Personally, though I love the traditions and festivities of Christmas, it's been one of my least favorite holidays because of the stress and pressure it puts on people - wanting to impress family members you may only get one chance per year to impress and wanting to give your young children the best Christmas possible. It's a big part of why I love Halloween so much - there's no pressure, it's just about fun. It IS comforting to know I'm not the only one that feels that way though.